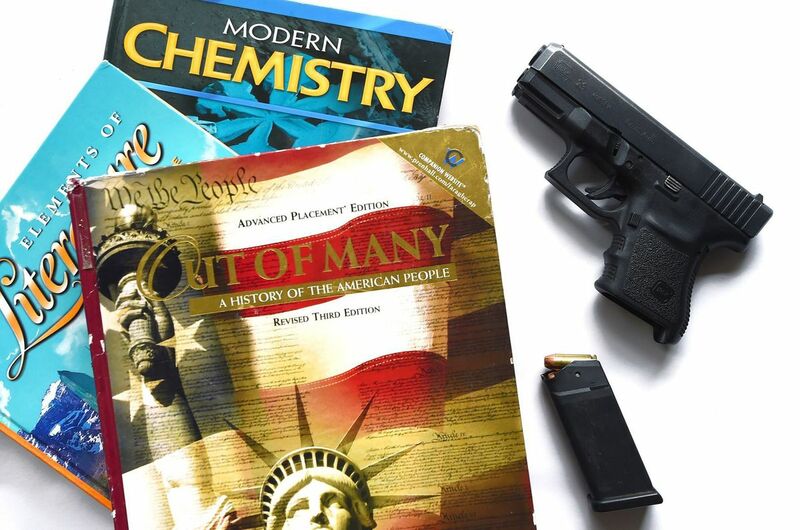 If you're a Pennsylvania teacher, you can Make America Great Again by bringing your gun to school. After all, you're a role model, so why wouldn't you want to protect yourself and your students by packing heat? And hey, if you're the kind of teacher who thinks bringing guns into the classroom is the way to do it, who am I to question you? Besides, what with you having a gun and all, I wouldn't dream of questioning you. And after all, what could go wrong? Cops carry guns all the time, and it's not like people get shot by cops. Okay, well actually there were 498 people, this year, and 963 the year before. Admittedly, cops have a very stressful job. They have to deal with difficult people who don't always do as they are asked. On the other hand, teachers, well, we kind of have to do the same thing. Personally, I can't conceive of an instance in which I'd have wanted to shoot a student. On the other hand, neither can I conceive of an instance in which I'd have wanted to carry a gun. The thing is, I wonder if someone inclined to carry a gun might be more inclined to use it. Now sure, they say the people who carry guns to school will receive training. I don't know about you, but I get trained in some new and indispensable way to teach each and every year. It doesn't mean I'm gonna use it. I also sat in a defensive driving class with maybe thirty people a few weeks back. Does that mean no one will have an accident? There are risks involved with having guns in your home. There are higher risks of homicide, suicide and accidents involved with their mere presence. Does anyone think these risks won't be transferred to school? Does anyone think everyone in a school building is immune to bouts of temper, or losing control? I mean, believe it or not, even administrators are human. I used to teach writing Saturdays at a community college. Whenever I teach writing, the first thing I do is, you know, make everyone write. That way, I can see where they are and what they need. One day, a student wrote something like, "Everybody has a gun. I have a gun." I was working with a senior tenured professor that day, and I told him I did not want this student in my class. He said he would take him. For whatever reason, I never saw that student again in any class. I didn't know this student at all. I had no reason to believe he was crazy or dangerous. His bad judgment in letting me know that could easily have been naivete. He seemed perfectly friendly and non-threatening. In fact, he may have been boasting just to show me how cool he was. I didn't care. The risk of having someone with a gun in my classroom was unacceptable. Now I've been teaching for over thirty years, both high school and college, It's entirely possible I faced students with guns.without having the remotest clue. But the fact is, on the single occasion when it appeared to be a possibility, the first thing I did was say it was unacceptable. I guess I was fortunate that the professor said what he did. Honestly, I questioned his judgment. Perhaps he didn't see the danger I did. On the other hand, perhaps he did something to ensure the student's absence the next week. I would certainly have walked from that job rather than teach a student I knew could be carrying. Given all that, I find it completely unacceptable that PA schools allow such a thing. Politicians who enable it are a bunch of morons, indifferent to not only education, but also human life. They will say this will reduce the chances of some gunman coming into the school and going nuts. I doubt it. There are simple reasons why homes with guns have more accidents, homicides and suicides than homes without guns. I don't doubt there are responsible gun owners, but neither do I doubt there are irresponsible ones. I don't doubt at all that allowing guns in school will cause unnecessary and fatal incidents, and that the chances of such incidents are much higher than those of in-school terrorism. This brings stupid to a very high level, right on par with allowing Donald Trump to be President.